Italy held a state funeral for 37 victims of the last week’s 6.2-magnitude earthquake. The ceremony has been held in the town of Amatrice, which bore the brunt of the disaster. Coffins of the victims, including those of two children, were laid out in a marquee on the edge of the town. The venue was chosen at the last minute after relatives rejected a plan for the funeral to be held in a hangar in Rieti, about 40 miles away. 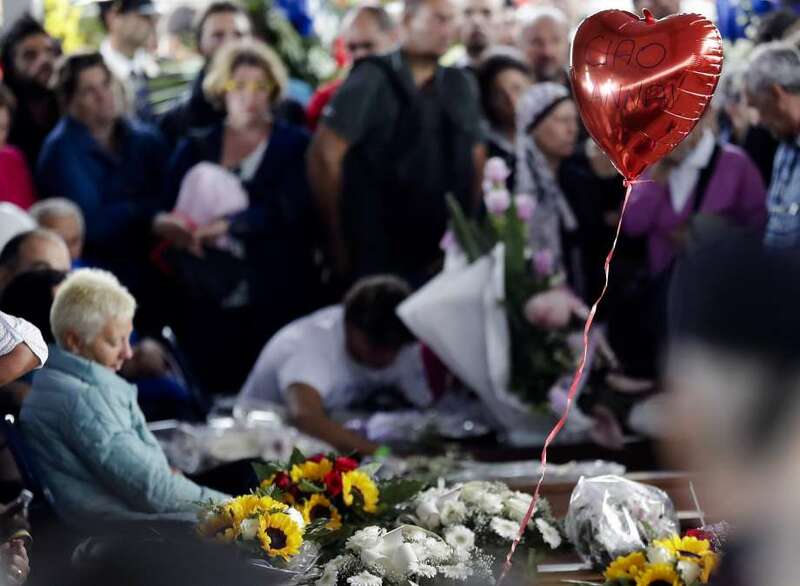 Italian Prime Minister Matteo Renzi and President Sergio Mattarella were among the mourners. Of the 292 people known to have died in the earthquake, 242 were from Amatrice or nearby Accumoli. Today’s funeral Mass in Amatrice began with the names of the victims being read out. Many families were overcome with grief during the ceremony. In an address, Bishop of Rieti Domenico Pompili urging leaders present not to allow “political quarrels” to delay reconstruction. “If we abandon these villages, we will kill them for a second time,” he said. Most victims were Italian, but several foreigners were among those killed. Romania’s PM Dacian Ciolos attended the funeral to honor the 11 Romanians who died in the earthquake, most of them in Amatrice. Teams of workers are still searching the rubble in the town for up to 10 people still missing, presumed dead. It was the second state funeral held for earthquake victims. Another was held on August 27 for 50 people killed in the neighboring Le Marche region. Italy is to build wooden chalet-style huts within three months for the 2,500 people displaced by the earthquake, Italian media reported. Authorities want to get survivors into safe, warm accommodation before winter arrives in the mountainous central region. PM Matteo Renzi discussed reconstruction plans on August 28 with Renzo Piano, one of Italy’s most renowned architects. There has been criticism in the Italian press over building standards in high-risk areas. Some of the buildings that collapsed had recently been renovated.